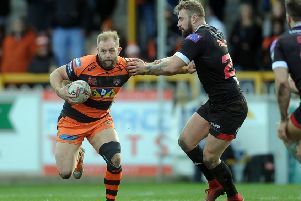 After going into last Friday’s game just two points behind the table topping Saints the Tigers were given a real hiding on their own turf and were left with some real soul searching ahead of their return to action at Leeds Rhinos tonight. It was a case of one team right on top of their game and the other way short with Cook labelling his side’s display “not good enough”. He said: “We are disappointed – really disappointed. “We thought we let ourselves down a lot with just the way we went about things in a lot of areas in our game. “Defensively we were not at our best at all. Saints were class, though. You’ve got to show respect there. They really stuck it to us and hit us hard with everything they had and we didn’t cope with it. Cook is surprised to see next opponents Leeds propping up the Betfred Super League table. He said: it’s going a bit tough for them at the moment. “There’s been some real close results for them with the games just gone away from them right at the very end. But they’ve been in them for most of the game for a few of those. “They’ll be looking to get back to winning ways themselves, especially on home soil so we can’t underestimate them. “There’s some big names in their team and we’ll have to be at our best and vastly improve on our display against Saints. “They’ve got the big names in there like Trent Merrin but they have some young guys in, too, who are really looking to make a mark. “There’s people like Oledzki, Cameron Smith and the young prop Tom Holroyd who, having done the review, I know is only around 18 years old but has some size about him. “They’ll keep coming at us and we have to make sure we get on top. Cook is pleased for his teammates who have received international recognition this week with inclusions in the England Performance Squad.